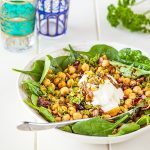 Place the chickpeas in a bowl add the onions, garlic, cranberries, preserved lemon, spices, olive oil, lemon juice and soy sauce in a large bowl. Toss to combine and leave to marinate for at least an hour. Line a serving bowl with the baby spinach leaves and top with the chickpeas and parsley. Top with the yoghurt, pistachios and drizzle with the pomegranate molasses. I used La Dalia Sweet Smoked Paprika from Spain which provides a beautiful smokey sweet flavour. Make it vegan by using a vegan yoghurt.